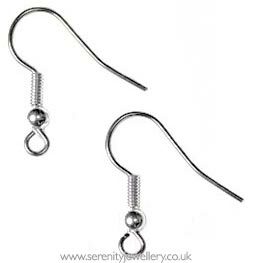 Hypoallergenic stainless steel earring hooks (ear wires) with silver coils and beads to replace the hooks on existing earrings or to make your own. earrings. By using these I have managed to re use most of my favourite - but painful to wear earrings, You can to. Pliers and time is all you need. These have been very comfortable to wear with no reactions. It has been very simple to convert some non-hypo earrings I was bought as a present to ones I can now wear! My daughter can only use surgical steel and as there isn't a lot of style to choose from (unless piercing jewellery what is much thicker) these are great to make your own. Would recommend! I love these, it means I can make earrings that don't make my ears sore! These hooks are perfect. My daughter and I both have a severe allergy to nickel so feel confident wearing earrings I have made with these hooks. can now be imaginative with these!